Receive the Historical Messenger in your inbox once every two weeks by signing up for our mailing list! Old News: The Circus Comes to Stillwater! October definitely brings some mixed feelings. On one hand, I do love popping on a sweatshirt and taking a stroll around the neighborhood. But on the other, our museums are only open for a few more weeks! So don’t let 2016 pass without visiting the Warden’s House and Hay Lake School! Until the end of this month, the Warden’s House is open Thursdays-Sundays and Saturdays & Sundays for Hay Lake. 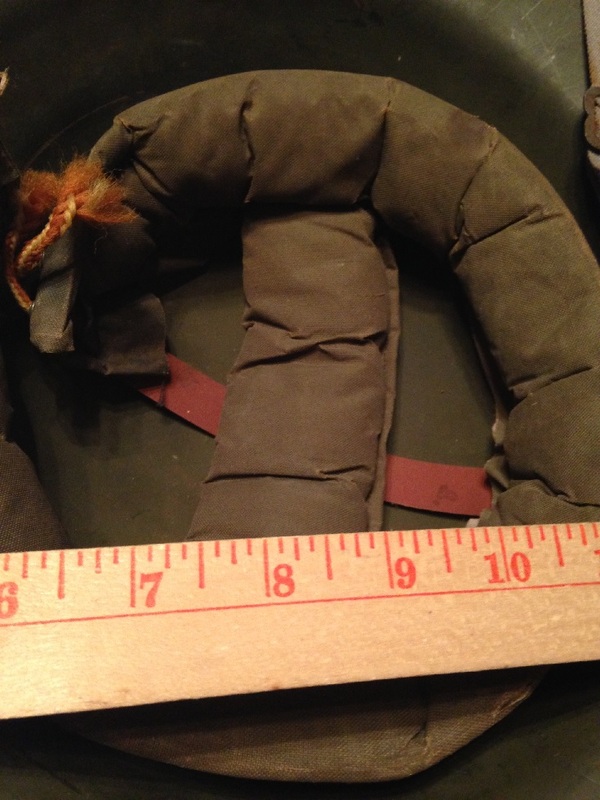 Of course, we’ll see if you clever folks can tackle a new “What Is This Thing? !” challenge. Every now and then, I’ll have folks ask me, “What did people do for fun in the 1800s?” Well, head on down to our Old News section to read about the event of the season from way back in 1870. 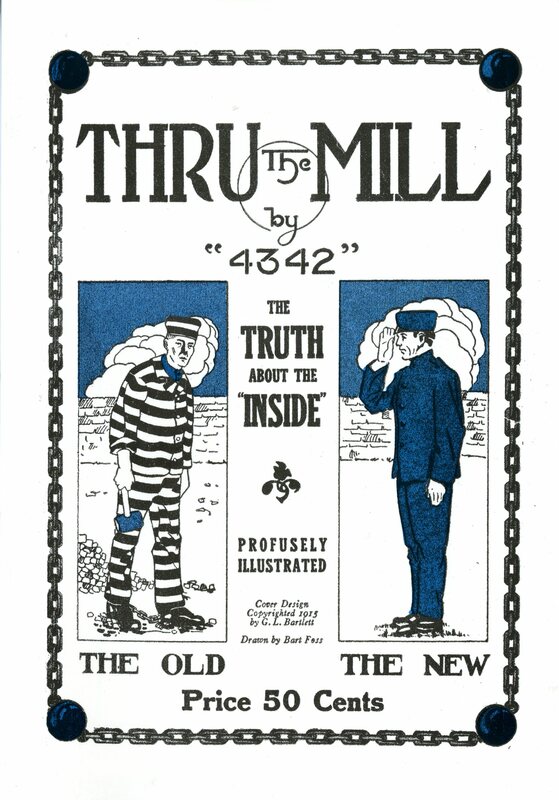 Finally, we’ll close up today’s e-newsletter with a sneak peek at WCHS latest publication, Thru the Mill, the tale of one man’s experiences as an inmate of the Old Stillwater Prison. Join the Washington County Historical Society for a night of (relatively quiet) terror beneath the stars as we screen the 1925 silent-film classic “The Phantom of the Opera” at the Warden’s House Museum! Bring out the family and help re-capture some of the lost magic of watching a movie outdoors! The screening will begin at 6:30 PM and the museum will be open to the public from 5:30 until when the film begins. The movie will be shown outside so we recommend dressing warm and please feel free to bring lawn chairs & blankets to sit on. The selection of “The Phantom of the Opera” is not only appropriate for the Halloween season – but also because the film features the performance of Olive Ann Alcorn – a Stillwater native! This is a free event made possible by WCHS’ generous supporters and donors. 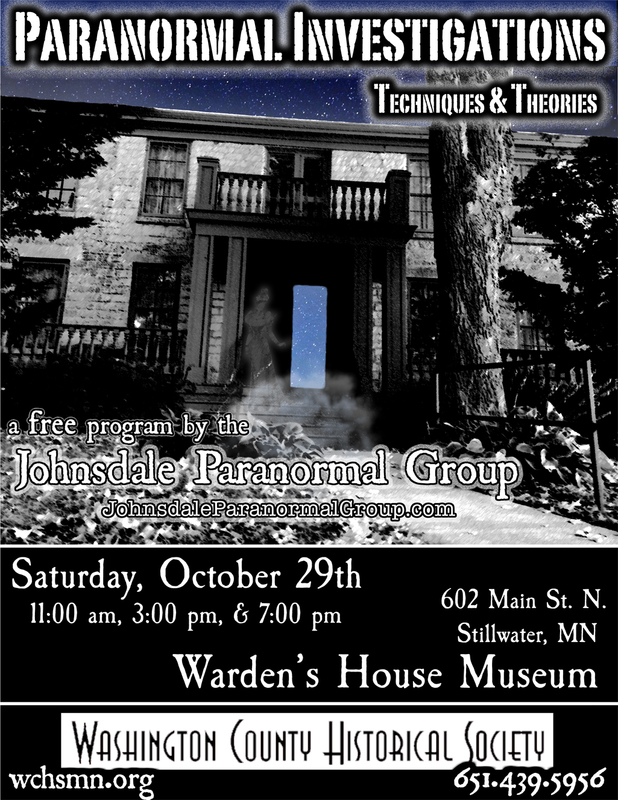 On Saturday, October 29th, the Johnsdale Paranormal Group will host their fourth annual, “Paranormal Investigations: Techniques & Theories” program at the Warden’s House Museum. The free event will be held at the Warden’s House Museum in Stillwater. Encore presentations will be held at 11:00AM, 3:00PM, and 7:00PM. Each time slot will feature the same program and will last about 80 minutes. For the past 7 years, the Johnsdale Paranormal Group has been performing investigations at such famously haunted locales such as the Mabel Tainter Theater in Menomonie, WI, Waverly Hills Sanitarium, KY, the Squirrel Cage Jail in Council Bluffs, Iowa, and of course, the Warden’s House itself! During this free and open to the public presentation, founder Justin Miner and his co-investigators will delve into the truly amazing audio and video evidence they have collected while explaining the state-of-the-art equipment, theories, & techniques used during a “ghost hunt”. 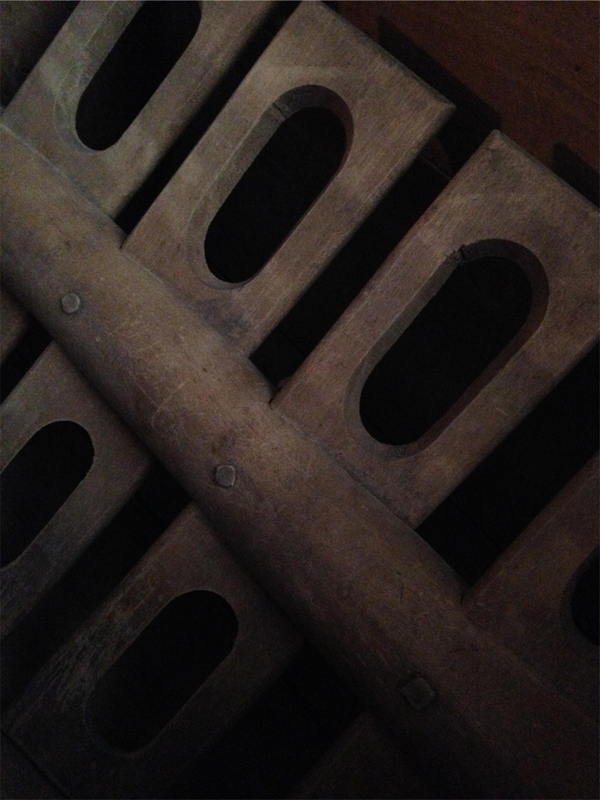 A handful of you took a t-churn at guessing the true identity of last week’s zoomed in What Is This Thing?! And a few even managed to guess that yes – indeed this is a butter churn! So, get it…”t-churn” instead of “turn”! Yeesh, that’s…that’s just even a joke. I’m really sorry everybody. You know, I put all this time and effort into making puns and I Can’t Believe it’s Not Better. I grew up here in Minnesota, the Land o’ Lakes itself so I should know better. 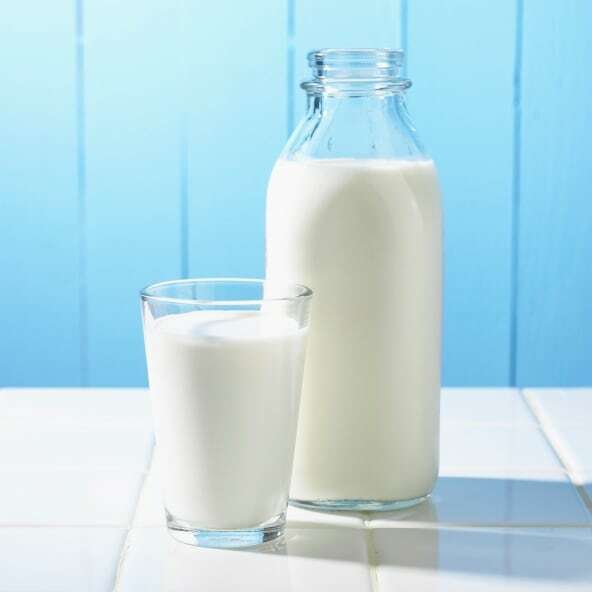 We pride ourselves on being ‘crème de lacrème‘. Next issue, I’ll reevaluate my writing and try my hardest to be less cheesy. 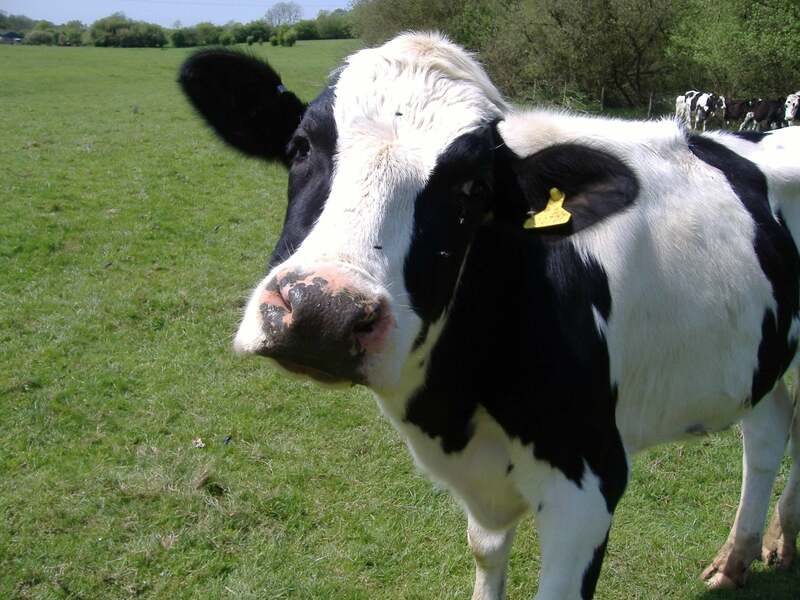 You can all cow-nt on it. …I think I’ve milked this enough. Eh, hem. 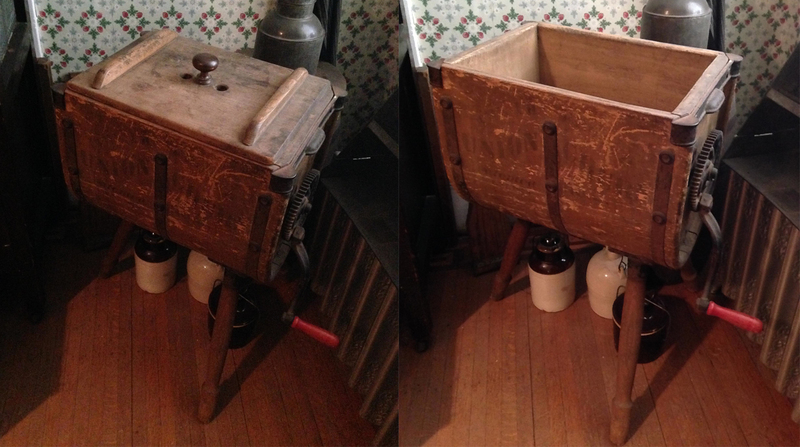 Anyways, this is a rather large commercial-grade machine known as a “Union #1 Butter Churn“. On the opposite side of the hand crank, the company went out of their way to even specifically list all the State Fairs at which their design had won awards. Among those was the prestigious 1893 Chicago World’s Fair! Time to zoom in to our next artifact! Can you identify the WCHS artifact photographed above? If you’d care to venture an answer, you can send an email to me at sean.pallas@wchsmn.org, tweet @WCHSMN, or post your guess on our Facebook page. The Circus Comes to Stillwater! I think there’s a misconception that county historical societies are 100% and entirely focused on their small narrow pieces of local histories. And while, yes, we will chronicle the lives of our communities’ farmers, politicians, wives, and doctors…these men and women didn’t live in a vacuum. There are plenty of opportunities to tie historic Stillwater to the big picture of American history. Dan Castello’s Great Circus and Egyptian Caravan’s visit to Stillwater in October 1870 is perhaps one of the most fun. Now, you may have not heard of Dan Castello (pictured to the right), but he had made a name for himself the previous year by being the first circus to perform on both coasts of the United States in the same season. The endeavor was enormously successful and earned him a reported $60,000 (about $1 million in 2016). Stillwater was actually one of his final stops on his Egyptian Caravan tour. The whole operation spent the year traveling aboard the 152 foot long Benton, loading and unloading the entire operation at water adjacent venues along the Great Lakes and Midwest. Naturally, this included the highlight of the “Egyptian Caravan”, the 8 camels purchased from the Army after they proved to be unsuccessful replacement mules in Arizona and Nevada. A staunch Unionist, Castello’s performance also concluded with a satirical depiction of a Ku Klux Klan initiation ceremony. It’s not hard to imagine Stillwater’s Civil War veterans enjoying this jab at the inheritors of Confederate-ideals. 1870 would be the only year Castello would tour with this group, for he was destined for bigger and better things. 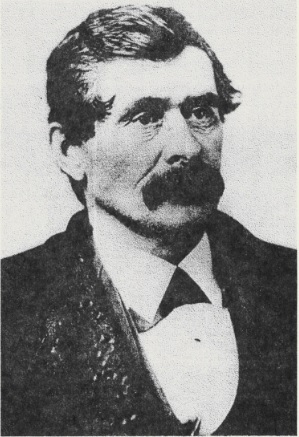 In 1871, Castello and his co-investor William C. Coup entered a partnership with the legendary P.T. Barnum. The three revolutionized the circus-industry and would eventually develop the “Greatest Show on Earth”. Dan Castello’s Circus and Egyptian Caravan, are advertised for this city next Saturday afternoon and evening. This is the first circus that has visited us this season, and from all reports, we believe it to be the best show traveling. At all events, they understand the value of printer’s ink, as attested by the flaming advertisement on this page, and their mammoth posters around town.The last are a good show themselves, and triumphs of the art of printing. There is connected with this show a first class ballet troupe, which is a new featured, and attractive, in the business. Those desirous of seeing a show of this kind had better tend out on this one, as it will, in probability, be the last. The above information about Dan Castello’s life is from “Grand Entree: The Birth of the Greatest Show on Earth, 1870-1875”. Available online. No changes have been made in these rules for a number of years, to my personal knowledge, as I have seen copies of them dated as far back as 1905, the same as these given here which are quotes from the 18th Biennial Report of the prison for 1913-1914 recently published. Changes in conditions have not in any manner affected the rules themselves. A good example of this is found by noting paragraph 12, under Shop Rules, just quoted. Any inmate found with a pencil in his possession, unless he had special permission from the Warden or Deputy, was reported for breach of discipline. But, any prisoner who had the money could purchase a fountain pen from the Steward’s Department, which he might carry and use as he liked. As far as I could learn regarding this ruling, the carrying of pencils was prohibited some time ago in order to keep prisoners from writing notes to each other. When the fountain pens were permitted, the rule regarding pencils was still kept in force, and officers were reporting men for breaking the pencil rule when I left the institution. This is one of the many such rules that make it harder for the poor devil obliged to obey them, with no real advantage of benefit either to him or the institution but a source of worry to both. It is also stated in the rules governing Guards and Officers, that no prisoners shall at an time be allowed in the yard at night unless in the custody of an officer. During the summer of 1913 a convict affected with tuberculosis received permission to sleep in a tent in the prison yard. When his work was done for the day, he reported to the Cell House with his regular crew, got his supper and went to his tent, in the upper part of the yard, escorted by an armed guard, where he was left the rest of the night unguarded. In the morning he reported to the Hospital Building, near which his tent was pitched, and the officer accompanied him to the Cell House. Though this prisoner was left all night in an open tent with no guards on the walls and no one to watch him, it was deemed necessary to have an officer go with him and from the tent to see that he did not run away. This was according to the rules, and though the officer who used to walk with him through the yard often told me how foolish he himself used to feel when taking this prison to and form the Cell House, he realized that any deviation from this method of procedure might be cause of his dismissal. The tobacco was passed to the cells by the Cell House Captain, Sunday morning just before chapel. No outside tobacco of any kind was permitted. Third grade prisoners at the old prison ate all their meals in their cells, which were dark and gloomy, located in the Dark Block, behind the Library, and shut off from all light from the front windows. At the new prison they eat in a separate portion of the regular dining room, but are given only stipulated amounts of food at each meal, the same in quality as the upper grades. No tobacco, papers, mail or privileges of any kind were allowed third grade prisoners, except bathing and chapel. Letters and papers received fro them were kept until they were advanced to the second grade. Their hair was kept clipped short, and wearing the striped clothing they were marked as bad men and their every move watched. Altering clothing, bed not properly made, clothing not in proper order, communicating by signs, defacing property, dilatory, dirty cell or furnishing, disobedience, disturbance in cellhouse, fighting, hands in pockets, hand or face not clean, hair not combed, insolence to officers, insolence to foremen, insolence to fellow prisoners, inattentive in line, inattentive at work, inattentive in school, laughing and fooling, loud talk in cell, loud reading in cell, malicious mischief, not out of bed promptly not at door for count, not wearing outside shirt, not promptly out of cell when brake is drawn, out of place in shop or line, profanity, quarreling, shirking, spitting on the floor, staring at visitors, stealing, trading, talking in chapel, talking in line, talking in school, talking at work, talking from cell to cell, talking in corridor, throwing away food. After a prisoner has spent his first 30 days in the Silent City, he discovers half a hundred more offenses not mentioned above. These he becomes familiar with, generally by either receiving a severe reprimand, or being reported and sent to court for breaking them. Ignorance of the law, especially in Stillwater prison, is no excuse for the offender. Note the 22nd offense on the above list, “Loud talk in cell.” I never heard an explanation for this ruling, as it was an offense punishable by solitary confinement to even read aloud or talk to one’s self in the cell. This rule was probably in force years ago when two men were permitted to occupy one cell, and has never been changed on the records. 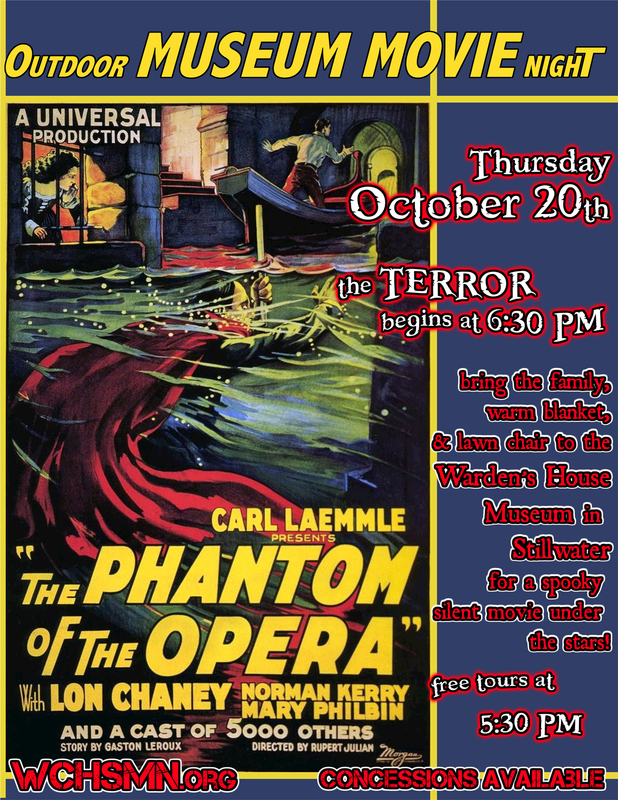 10/20 “Outdoor Museum Movie Night presents: The Phantom of the Opera” – Warden’s House, Stillwater – 6:30 – 8:00 PM. Free! Preserve the Past, Share in the Future! Membership is one way that you can help support the Washington County Historical Society. Your membership helps us collect, preserve, and disseminate the history of Washington County for county residents and visitors in the belief that a historical perspective enhances our understanding of community and sense of place. The Washington County Historical Society has depended on membership ever since it was formed in 1934. Please show your support for the organization by becoming a member today. Washington County Historical Society collects, preserves, and disseminates the history of the county and state of Minnesota.